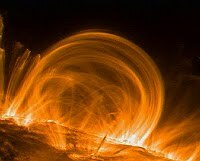 Welcome to the Solar wave modeller blog. This area will be used to report an activities in solar physics and in the development of a computational MHD framework used for modelling solar wave phenomena. Parallel magnetohydrodynamic (MHD) algorithms are important for numerical modelling of highly inhomogeneous solar and astrophysical plasmas. SMAUG is the Sheffield Magnetohydrodynamics Algorithm Using GPUs. SMAUG is a 1-3D MHD code capable of modelling magnetised and gravitationally stratified magnetised plasma. 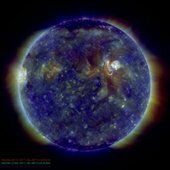 The methods employed have been justi ed by performance benchmarks and validation results demonstrating that the code successfully simulates the physics for a range of test scenarios including a full 3D realistic model of wave propagation in the magnetised and stratified solar atmosphere.